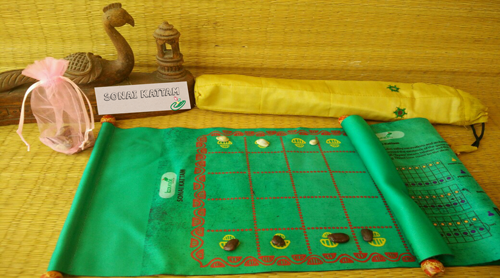 Played on a grid of five rows of horizontal square, Sonaikattam is an ancient game that is said to improve concentration and math skills. This set comes in the form of a fabric scroll, with rules printed in the reverse side. Also included in the set: 8+8 game pieces and dice.